CamCentral Systems Inc. is pleased to now offer high quality exacqVision video surveillance products that are built to order and provide excellent performance. Customers can rely upon the advanced Video Management Software from exacq which provides the latest video surveillance features. Both hardware and software products are available from exacq that combines to create robust solutions for locations that require high quality digital video surveillance. 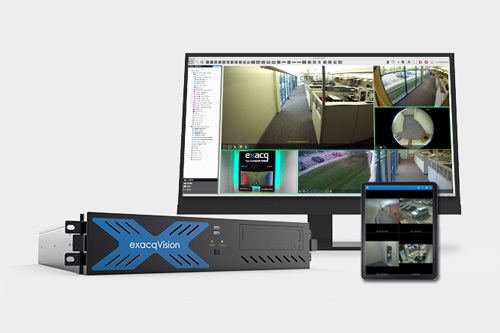 Exacq offers custom built exacqVision IP camera servers, hybrid video recorders, video management system (VMS) software, video encoders and much more. Fully featured video surveillance solutions can be built using products from exacq. exacqVision Video Management Software (VMS) is compatible with AXIS network cameras which provides the very best digital video surveillance solutions for a variety of location types. High performance AXIS cameras can be used to capture video footage that is managed by exacqVision software and hardware. Contact CamCentral Systems Inc. today to order the latest exacqVision video surveillance products. Custom solutions are available for all types of locations which require high performance video surveillance technology.